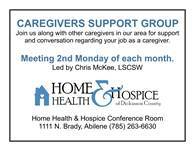 Home Health & Hospice of Dickinson County will host a support group for caregivers on the Monday, December 11th, at 6:30 p.m. in their office conference room located at 1111 N. Brady, Abilene. Everyone is welcome to attend. If you care for a spouse, parent, family member or friend, you may be able to help others who are new to caregiving. If you have recently admitted your loved one into a nursing home or assisted living facility, you may have questions or concerns that the group could help answer. The purpose of the group is to provide support for caregivers who are dealing with a variety of situations. 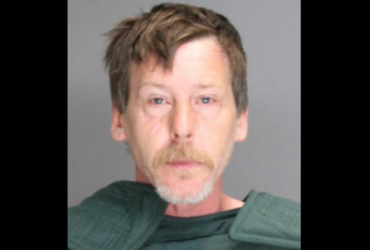 If you have any questions, or would like more information, please contact Home Health & Hospice of Dickinson County at (785) 263-6630.